"Estate Management is so great! I call them my LL's (Lifesavers and Luxury)... everything that matters to me matters just as much to them. I'm amazed to have found such incredible partners." "It has been an absolute pleasure working with Vince DeStefano and the Estate Management Division of BCB Homes. Their responsiveness, professionalism, and access to resources has greatly simplified the challenge of managing our second home in Port Royal. With the peace of mind that BCB is protecting our investment, we have never enjoyed our home more." What will you do with more free time? Enjoy life and leave your home management to us. The BCB Homes Estate Management team combines construction expertise with a white-glove approach tailored to your specific needs. We provide a customized plan to preserve your home and all of its features. With our vast construction knowledge and superior network of subcontractors, BCB Homes Estate Management has the resources and foresight to recognize and resolve potential concerns before they develop into more complicated issues. You will have one person dedicated to the management of your home, providing you ease of communication and peace of mind. BCB Homes will tailor an inspection & maintenance plan to give you confidence that your home is being fully cared for whether you are home or away. Our in-house inspector performs a sweeping visual inspection of everything from air conditioning condensers and drains, landscape and lighting, pool and spa, structural wear and tear, driveways, windows and doors, balconies and terraces, home appliances, fireplaces, signs of water intrusion, security systems, smoke alarms, generators, and other relevant home features. Your roof is one of the most important aspects of your home, but weather, wind and debris buildup can lead to leaks and other damage. With regular maintenance, problems can be detected before they cause damage, thereby extending the lifespan of the roof. The BCB Homes roof inspection, performed by members of our Building Science Division, is a comprehensive, 70-point assessment to analyze the integrity of all roof features and components. Maintenance and repair recommendations are provided to you in a pictorial report. As a separate but equally important service, we can provide a specialized roof cleaning & maintenance program. These treatments use a specially-formulated cleaning agent to attack algae, moss and lichen at their root structures, adhering to the roof (invisibly) for sustained control against growth. Application occurs every six months to refresh the enzyme treatment. Our Building Science experts will record specifics for each window and exterior door in the home for routine inspection. The inspection involves opening and shutting all windows and doors to test operability and inspect the health of hinges, tracks frames, seals and locks as necessary. Tracks will be wiped and lubricated as necessary. The technician will identify and recommend repairs respective to each affected window/door. Air conditioning is necessary for comfort in Florida homes, but mold and mildew can cause significant damage when humidity is not adequately controlled. A regular maintenance plan is important for preventing clogged drain lines, excessive moisture, and deterioration of your compressor equipment. Our experienced Estate Management team can make this maintenance an effortless and worry-free experience by customizing a plan to test for refrigerant leaks, clean or replace filters, flush and treat condensate lines, test and clear drain lines, and provide you with reports, photos and solutions for items that require attention. 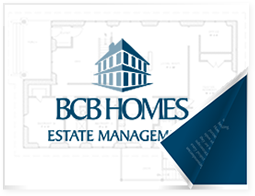 The BCB Homes Estate Management team has your needs covered for electrical, lighting control, and audio-video systems. Scheduled inspection and maintenance plans are customized to your home and lifestyle. With one of our preventative maintenance plans in place, you won’t have to worry about interior and exterior lighting issues, replacing burned-out lamps, testing smoke alarms, or personally ensuring that your electrical, audio-video, and low voltage systems are in excellent working order, especially when you’re counting on it most. Your Estate Manager will ensure optimal performance on exterior services like landscape health and maintenance, maintenance of pool, spa and related equipment, motorized entry gates, pool fencing, docks and lifts, and the home’s structural envelope. The result is aesthetic and functional assurance of your exterior premises so that you can enjoy your home in its entirety. For a complete list of services offered, please click here and download our brochure.